BestDroidplayer - Latest Kodi Tips, Tutorials, Guides and News - The best and latest Kodi Tips, Tutorials, guides and news to provide you all you need to enjoy the most of your streaming device. So, you’ve decided to get the best Android TV box that money can buy? Well, then DroidBOX may have the right box for you. Here you’ll find all the relevant info on the much loved DroidBOX T8-S Plus V2 TV box and also DroidBOX iMXQ PRO V2. Whether you want to watch TV shows, movies, clips, or simply play games, these little guys have much to offer. 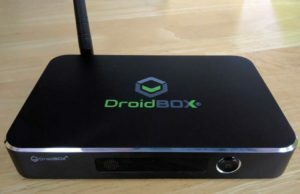 I will start reviewing the DroidBOX system and features that are common to both boxes, then review these 2 Android TV Boxes and finally compare them, so that you can clearly see which one would better suit your needs (and means, of course). Or just jump to: DroidBOX T8-S Plus V2 Review, DroidBOX iMXQ Pro V2 Review, Comparison, Final Verdict. What makes DroidBOX Boxes stand out from the crowd is their dual-boot systems. Meaning, it features two operating systems – Android 6.0 Marshmallow OS and LibreELEC (Kodi), allowing you to switch between these two operating systems at any time. Android 6.0 Marshmallow OS works great, whether you want to play games, use youtube, skype, kodi, etc . Also, it offers access to the Google Play Store, making it easy for you to find your favorite apps. LibreELEC is based on Kodi, so it’s ideal if you plan to use this streaming box just for Kodi. The big benefit is that uses low resources, making it super fast and capable of performing almost any task, while it can simultaneously stream efficiently. As for the setup, it’s a breeze, and you certainly won’t have any trouble with that. When you want to switch back to Android, simply click in the kodi power button and you will find an extra option to switch to Android. One of the most important things is the interface. You surely wouldn’t want the one that is not properly organized so that you would have to waste your time on finding certain apps or games, would you? Luckily, the experts at DroidBOX have thought of that as well. Therefore, they created a simple and readable interface, well organized, to make everything go as smooth as it should. There is a part of a screen where your favorite apps will be located, to provide you with fast access to them. Moreover, there are a DroidBOX media center, DroidBOX Share, the Google Play Store and LibreELEC. Not to forget that there is also a user-friendly settings menu, date and time, and weather forecasts. As you can imagine, using these devices is no hassle at all. In fact, it is very easy, as everything is only a few clicks away. DroidBOX Marketplace: Thanks to the DroidBOX marketplace you get access to apps that the team at DroidBOX has picked for you in order to make everything even easier. DroidBOX Control Centre: This handy little app allows you to reset or register your device, as well as containing how-to guides (which are extremely useful for novice users), Kodi fixes, and more. Quick support – if you encounter some issues with your device, it’s always best to leave that to the experts. That’s why the DroidBOX team has come up with Quick support. As the name itself suggests, the staff will help quickly resolve any technical problems by way of accessing your device remotely. OTA updates – ensures that your Android TV Box gets the latest firmware updates so that your device will perform the best it can. Another great thing is the technical support. Should you have any questions or issues with your device, you can contact the Technical support and they will make sure to help you right away. Within first two weeks of buying, if the product didn’t meet your expectations and you want to take it back you can. You will get a full refund minus a handling fee. Their units come with a 1-year warranty. So, let’s now find out why the T8-S Plus V2 and the iMXQ Pro V2 from DroidBOX are so special and have been a remarkable entertainment media hub at numerous homes everywhere. For those of you who have heard or perhaps used DroidBOX T8-S, you’d be happy to hear that something even better has been created. Meet the DroidBOX T8-S Plus V2 – a mean little device that will turn your TV into an exciting collection of movies, games, apps and much more. This V2 is faster than its predecessor, making it ideal for 4K UltraHD. It is very user-friendly, thus it’s ideal for everyone. 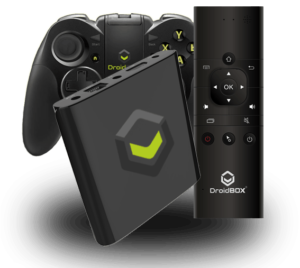 Powered by dual boot systems and featuring DroidBOX Share and OTA updates, this stylish Android TV Box will make operations and updates go smooth and fast. Now, let’s take a look at what makes this device a good buy. Before I got the TV Box, I was expecting something quite ugly as I normally don’t find boxes with big antenas pretty. But then I’ve unpacked and it actually has a really nice looking! It has a very good metal body and that gives this streaming box a premium feel! On the front, there is an LCD display showing the time, and a power button. On the side, you’ll find 3 USB ports, and a SD card slot, while on the back there are Ethernet, Optical Audio out, HDMI, and Power Port. Thanks to such a nice organization of ports, the cables will be in a perfect order, without creating any clutter. Moreover, the dimensions are 178mm x 142mm x 28mm and the weight is 400 grams. This means that you can place the device on your desk, or if you prefer keeping it off sight simply place it behind your TV. The antenna is actually very handy because you can point it to your rotter to get more Wifi signal. Thanks to an Amlogic S905 processor, the device runs fast, supports 4K Video Playback as well as HD Video Playback. Of course, this wouldn’t be possible if not for the high-quality graphics processor and a healthy 2GB of RAM. complete replacement with assignable buttons. You can also hook up your camera from your tablet or mobile phone. I found DroidBOX share a cool app to have in your TV. Made with customers in mind, it is not surprising that this device is very user-friendly. Not only it is simple to use, but it also offers top notch support. There is also a full user guide, to help you get started as soon as possible. The manual is easy to understand, so the setup is fast and easy. As far as the memory is concerned, you don’t need to worry about that. Even though this device is small, it offers a plenty of space to store your favorite files (documents, images, music, movies and much more). The onboard storage is lovely 32GB. However, if you have movies collections or simply want to have even more space, you can install an HDD disk to get full internal storage. This Android TV Box comes with a super-fast dual band Wi-Fi – 802.11b/g/n/ac. This means that wifi signal shouldn’t be a problem and you can connect to 2.4GHz and 5GHz wifi networks. 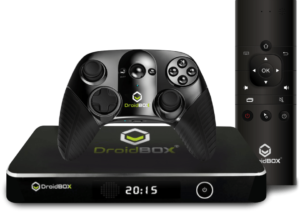 This device comes preloaded with DroidBOX Marketplace (where you can easily download all your favorite apps) a custom version of Kodi, as well as with DroidBOX Share (that lets you control the DroidBOX via your mobile or even tablet). Of course, it will take some time for you to get used to the way unit functions, but other than that, the unit is one of the best on the market, as far as the ease of use is concerned. Not only that, preloaded apps means that you won’t have to bother with finding and installing the apps on your own. Kodi – so that you can enjoy your favorite music, movies, and TV series just the way you like it. YouTube – Of course, with YouTube things are as good as they get. Enjoy the weekend with your friends and watch some funny videos from the comfort of your home. Or just do it alone, have a lazy Sunday with a cup of hot tea and some chocolate and watch your favorite YouTube channels. ES File Explorer – Obviously, a file browser is a must in order to keep your things organized and easy to access. DroidBOX Control Centre – To reset or register your device, and read how-to guides (which are extremely useful for novice users), Kodi fixes, and more. MX Player – With this amazing video player app, the device can handle any file format you need to open. Quick support – This is an app to get support from DroidBOX. As the name itself suggests, the staff will help quickly resolve any technical problems by way of accessing your device remotely. IPVanish – The Best VPN for Android TV Boxes and Kodi. A VPN will make you anonymous and bypass geo-blocked content. Office Suite – Yes, you read that correctly. The DroidBOX T8-S Plus even comes with Office Suite, enabling you to edit, create or view documents. OTA updates – ensures that your streaming box gets the latest firmware updates so that your device will perform the best it can. For all gamers out there, you’ll appreciate the Gamer’s Edition Bundle since you will have the chance to play numerous games with a cool bluetooth Gamepad. 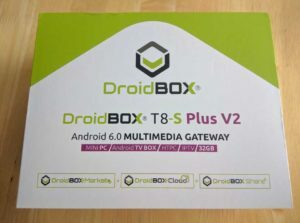 And there you have it – an in-depth DroidBOX T8-S Plus V2 review. Hopefully, you now have a better understanding of this powerful device and you can decide whether or not you want to invest in this kind of media streaming device. All in all, we are satisfied with the performance of this device, as it works fast and smooth. Moreover, it is simple to use, and the setup is easy. Not to forget the technical support that is ready to jump in and help you at any time. Even though the device is a bit pricey, we believe it is definitely worth the money. For those on a budget who are looking for a reliable media streaming device, this is the way to go. The DroidBOX iMXQ PRO is very affordable and is definitely worth every penny. Even though this model is not expensive, it still comes with a couple of great features. So, whether you want to enjoy TV shows, stream movies or music, or want to play games, this device can handle it all. With Android 6.0 Marshmallow, Amlogic S905X processor and Penta Core graphics processor, this device supports 3D gaming, 4k videos, 1080p HD videos, various music and photo formats. Not only that, but you get access to an array of apps since the device comes with the Google Play Store and DroidBOX Market. 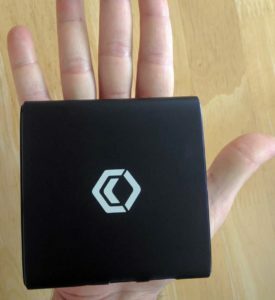 With 93mm x 93mm x 17mm and only 113 grams, this is the size of a palm, one of the smallest and lightest android boxes in the market! Takes up very little space so that you can place it near the TV, behind it or even attached to the back of the TV. However, if you choose to place it somewhere where you can see it, you will surely appreciate its stylish design. No doubt that the unit looks great (and performs great). What’s more, you will love its well-organized ports, to keep everything in just the perfect order. On the front there is a power supply receiver. On the side, you’ll find 2 USB ports as well as a Micro SD slot. On the back of the device, there are AV connection, Ethernet, HDMI, and S/PDIF Optical Audio out and the power socket. Thanks to the 1.5 GHz Quad Core Cortex A53 Neon Amlogic S905X processor, the device performs well. Meaning, it provides fluent navigation through apps, without the need to wait for a couple of seconds for a task to start. Thanks to a quality graphic processor, you can play a wide variety of games. The device can handle 4K video. Whether you are a novice user or have already used an Android TV Box, you will surely appreciate the easy setup of this model. Not only will the device be ready to start in less than 5 minutes, but it also doesn’t require any complicated steps to get started. The device comes with 16GB of internal memory, which should be more than enough if you just use it to stream. If you want to install games and store media libraries, than can insert a micro SD card and store your favorite movie collections, photos, music or whatever else you may want. Their own app that allows you to quickly fix minor issues. It also offers how-to and YouTube helper to help you run operations smoothly. Whichever file format you need to open, this handy video playing has got you covered! It can deal with any file format. There are two versions of YouTube. The first one is similar to the version on mobile phones and the second one is designed for use with the remote control. As you probably already know, the Google Play Store enables you to download a number of games, apps, and other utilities. This VPN app serves to mask your location. This is especially useful if you live overseas and want to keep up with British TV channels for example. 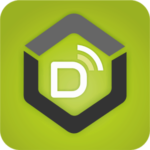 One more app created by DroidBox team, enabling you to quickly find any app you need. You’ll find a plethora of apps including internet radio, remote control apps, network apps, games emulators, launchers, games, etc. Of course, you can also find these apps in the Google play store, but searching for them will take more time. Also, you can be assured that any app downloaded from DroidBOX market will work for your Android Box. So, why not take the advantage of the DroidBOX market app and make things simpler? The device is preloaded with the latest Kodi, allowing you to stream HD videos to your TV and surf through thousands of media available online. With Quick support by your side, you will never again have to worry about something going wrong with your little streaming device. The technical staff is there to help, wherever you are. They will have access to your device from remote so that they can fix common issues with ease. Like with other DroidBOX models, with this one, you get great after sales support. The Dropbox team really puts their customers in front of everything else, so it’s no wonder why this company has loyal clients. Whether you want to ask a question, find out how a certain app performs, or you experienced some troubles with your device, feel free to contact the Technical support and they will help you straight away. For any DroidBOX device, if the product turns out to be not exactly what you wanted and expected, within the first two weeks of buying, you can return it and get a full refund (minus a handling fee). Like the previous model, this one also comes with a 1-year warranty. Well, that’s all from us folks. 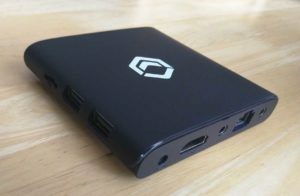 Now that you have gone through this in-depth review, you know pretty much everything you need to know in order to make an educated decision and get one of these media streaming devices. Both come with Android 6 Marshmallow, good GPU and CPU, come with all of the necessary apps that you may need. Best of all, these devices are not overpriced, you pay for the hardware, software and service that you get, making it an ideal choice for anyone who wants to have a worthwhile Streaming Box. Okay so, we did detailed reviews on both models separately. Now we will compare these two models so that you have a clear understanding of what they have and in what features they differentiate. So, we are starting off with the design. While the DroidBox T8-S Plus V2 is bigger than the DroidBOX iMXQ PRO, it looks more premium because of the metal body and LCD screen. Moreover, on the side and on the back there are more ports than with DroidBox iMXQ PRO V2. In the other hand, iMXQ PRO V2 doesn’t look much a premium streaming box but it it’s stylish, tiny, light and portable, you can fit it in your pocket. Since both models feature a quad-core processor, both devices can operate multiple instructions simultaneously, adding up to the overall performance and speed of the devices. Also, both devices feature a quality graphic processor, thus they support gaming and 3D films. Moreover, both models can handle 4K video. Both devices provide fluent navigation between apps, but T8-S Plus V2 it’s slightly faster as uses a better CPU / processor. Now, this is where these models differ. While the T8-S Plus V2 offers onboard 32GB for storing media files, the IMXQ PRO offers only 16GB, which is a significant difference of memory. Also the T8-S Plus V2 has a slot to insert an HDD disk, so you can transform this Android TV Box in a 1TB disk space TV Box. Both models have the same interface, that is simple to use and well-organized. As mentioned, there are some core apps always present on the screen, date and time, and “My favorite” apps which you can customize just the way you want. Both streaming boxes come with good Manual Instructions. Well, the last thing where these two models differ is definitely the price. Since the T8-S Plus V2 comes with all the bells and whistles, you cannot expect it to be cheap. However, the second model is low-priced and comes with enough features to perform great as a little streaming device. And there you have it – the comparison between the two top notch DroidBOX models that provide good value for the money. Whichever one you opt for, no doubt that you’ll be satisfied. If you are willing to spend a few extra bucks in order to get high-quality and reliable Android TV Box, you should go with the T8-S Plus V2. You must have noticed by now that this model has a lot to offer, including the great DroidBox Share app, a better processor / CPU, a lot more storage, an Antenna to get more WiFi signal and a premium metal body. This Android TV Box will forever change the way you enjoy your TV. On the other hand, if you are on a budget or simply don’t want to spend a fortune on a top quality Android TV Box, then the iMXQ PRO V2 has everything you may want or need. This model is a great choice since it is one of the best low-priced android streaming boxes on the market. Apart from the price, what actually makes this model so great is that it doesn’t compromise quality and performance. Sure, it doesn’t offer the best CPU and lots of storage, it comes with the right specs, enough to have a great experience and it does come with all the apps you are going to need in order to stream online media and enjoy plenty of TV channels. The Fire TV Cube – Is It Worth the Hype? How is the picture quality if you are streaming live match in South Africa with a 4MB connection? Bestdroidplayer provides you the latest Streaming Tips, Tutorials, guides and news so you can take the most of your streaming device. This is an informative blog, we are not associated with Kodi or any other streaming app / software. We do not create, run or own any streaming software / add-ons. We do not sell or distribute any product or service. On Bestdroidplayer you will find information about: the Best Android TV Boxes; FireStick / Fire TV Streaming Tips and Tutorials; The Best Streaming Apps for FireStick / Fire TV or other Streaming Devices; The Best VPNs to use with Kodi or with your streaming device; Lots of Kodi Tips and Tutorials; Plenty of installation guides of the best Sports Kodi addons, Best Kodi Addons for movies & series, Addons to watch live tv channels; And the most complete Kodi guide available online.